Laws and adjudicatory authorities are created to be respected by all. Their superiority cannot be overemphasised. The sustainability of peaceful and orderly coexistence of humans on earth is only tenable where the law is allowed to override and uninterruptedly take its route. Where the decision of the political leaders becomes the overriding authority, life becomes meaningless and undesirable for everyone. This is clearly what is manifested by the African leaders at the African Union Summit in South African and the unacceptable attitude of the South African government relating to the ICC arrest warrant issued against Sudan’s Omar Hassan al-Bashir. I consider this move an affront not only to the judicial authorities both local and international but also to the citizens of the Continent. We understand the frustration of AU leaders. However, it is undesirable and of course unreasonable to allow this honourable Union to be used as engine of illegality or to pervert the course of justice to the detriment of its subjects. This is unacceptable. While we acknowledge that solidarity among African states and by extension their leaders is necessary for forging African unity and development, we must loudly remind African leaders that they owe overriding allegiance to African citizens. Therefore, at all times citizens expect leaders to act in their best interest. Reluctantly and/or negligently allowing Omar Hassan al-Bashir, who has been accused of overseeing the killing of about 250,000 Darfurians (African citizens) to escape the long arm of the law, is a cause for concern. This is absolutely not in the best interest of the citizens of the Continent and particularly the people of Darfur. Thus it could be considered as a breach of duties owed to the African people to protect them from harm. This has far-reaching consequences because it sets a permanent bad precedent in international criminal justice. 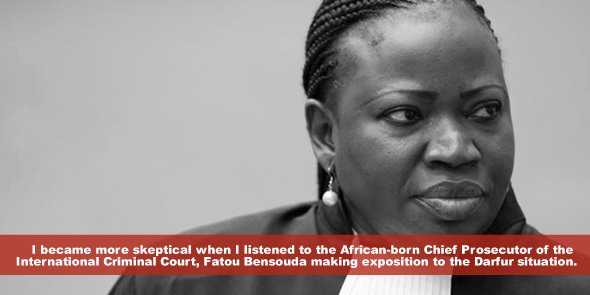 I understand that our leaders are not willing to further cooperate with the ICC due to the so-called belief that the Court is exclusively witch-hunting Africans. This dissatisfaction to my opinion should not be a ground for impunity and neglecting the lives of innocent persons particularly women and children who suffer many atrocities, many times at the hands of their own leaders. African leaders took a vow to abide by the laws of their individual state at all times and thus should not be flouting them at their pleasure. The judicial authorities created either domestically or internationally are created through laws which citizens and/or states have voluntarily endorsed. Thus, where we have willingly reposed our wishes, aspirations and rights to these institutions to safeguard and prevent the violation of our well-being, they should be allowed to exercise their mandates without interference. In conclusion, there is an urgent need to make a stop and redirect the trend in which the Continent is being driven. African leaders should be focused on coming up with projects and policies reflecting the development yearnings and aspirations of the people. African needs to develop its people to be able to compete intellectually, politically and economically with the rest of the world. This of course would not be feasible if innocent civilians continue to bear the brunt of insecurity and instability orchestrated by our backward, self-centred and inhuman leaders. Sheriff Kumba Jobe recently graduated from Faculty of Law at the University of The Gambia. He has a great passion for the promotion of human rights and democratisation in Africa. He is interested in doing the LLM in Human Rights and Democratisation in Africa degree and wish to work with institutions geared towards the implementation, promotion and protection of human rights. He is currently pursuing a professional course (BL) at Gambia Law School.